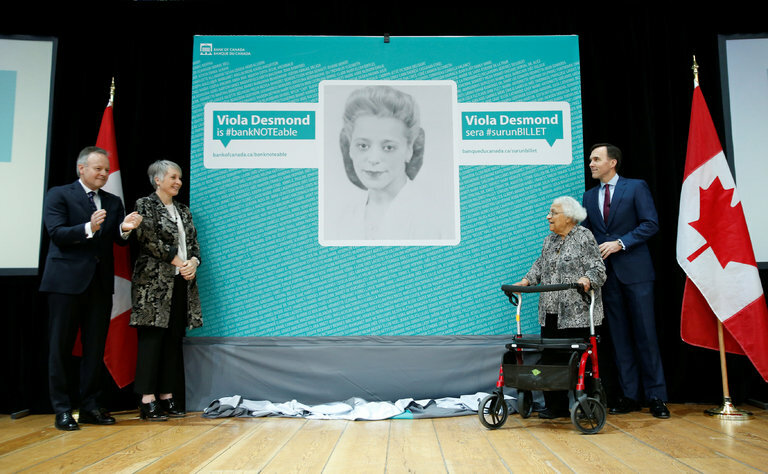 Canada’s finance minister, Bill Morneau, right, with Wanda Robson in Gatineau, Quebec, last year, after an image of her sister Viola Desmond was chosen to be featured on a new $10 bank note. OTTAWA — Nine years before Rosa Parks refused to give up her seat on a Jim Crow-era bus in Montgomery, Ala., Viola Desmond tried to sit in a whites-only section of a movie theater in New Glasgow, Nova Scotia. Ms. Desmond, a businesswoman who had her own line of cosmetics and who died in 1965, was prosecuted for trying to defraud the provincial government of 1 cent — the difference in sales tax for a seat in the balcony, where blacks were expected to sit and the whites-only ground floor ticket price. While she offered to pay the tax, she was convicted and fined 26 Canadian dollars, including court costs, at a trial at which the theater owner acted as the prosecutor and she was without a lawyer. A conceptual image of the front of the new Canadian bank note featuring a portrait of Viola Desmond.